Hi there! Happy Friday! Hope your week has been a happy one! I've been a busy bee this week, working in my sewing room, doing a little of this and a little of that. First things first, yesterday was Splendid Sampler day! Did you download your block and get busy? Happy Happy is the theme of Jen Kingwell's block, and indeed it is happy. I love Jen's style, don't you? I remember the first time I saw her Green Beans and Sweet Beans Quilt at Quilt Market I lost my mind I loved it so much. She continues to wow me each time she makes a new quilt. Magical is all I can say. Anyway, I love her block and while mine is a bit of departure from hers with no embroidery, I felt happy making it. I love how people are putting their own spin on it.. check out this block by Debbie Taylor.. so cute. I love the machine applique on it.. the 'x' through a couple of flowers and the bird! Perfect addition. While I was working on my kit for the retreat, which is still a couple of weeks away, I stopped to try out a block from the American Patchwork and Quilting sew along, It All Adds Up. This block is from the Easy Addition quilt by Brenda from Just a Little Bit Frayed. Just in case you don't know Brenda, she's a fabric designer and a shop owner as well. Check out her blog to read about all the other things she's up to. Anyway, I saw this scrappy version on the All People Quilt instagram feed. (made by Jeni Baker) I love that kind of scrappy, so I pulled out a bunch of my low volume prints and got busy. I pulled reds for the pluses and all the low volume prints I've had over the years and got cutting. Today I'll cut the accent pieces, then do all the subcutting. Once I'm done I'll pop it in a bag and I'll have a second project ready for retreat sewing. Your blocks are always so cute PKM! I can't wait to see that plus quilt! 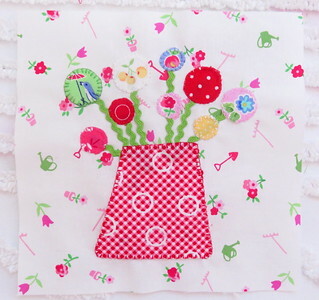 Your block looks so bright and spring-like with those happy fabrics. I'm also sewing along with a few sew-alongs (& slowly working my way through the Fat Quarter Baby Book - Love that book)!! 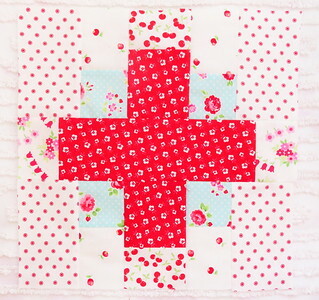 You might be happy to know, that I'm sewing the crossroads quilt with your happy fabrics. It is always hard cutting into some of those favorite prints - but I love the blocks they are making! What a fun project Pam. I am working on a UFO from last Fall and then I want to get back to the new projects I finished I started at Quiltcon last week. Lucky you, a retreat to sew your heart out at! I am so jealous. And you are so organized...impressive my friend! I love your fabric, that pretty pile of strips is calling to me. I hope we'll be seeing some more PKM fabrics soon, it seems like you haven't show any pictures from Holly's lately. What's the story? 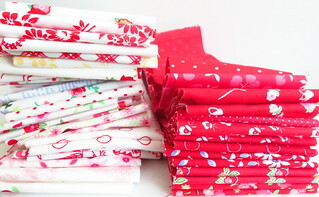 Will there be a nice fresh spring line of fabric at Quilt Market? I'm sure we all hope so. TGIF! I am sewing along with the The Splendid Sampler. I am posting my blocks to my instagram account, terry.conner.3762. Just wanna have fun!